The ideal outfit to wear to any 70's party, complemented perfectly by our "Mrs Jones" costume. 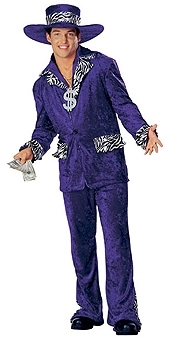 Comes with velvet jacket with zebra print trim, and trousers. Available in teen, medium, large and extra large. Size: Teen - Out of StockMedium - fewer than 5 available for next day dispatch.Large - fewer than 5 available for next day dispatch.Extra Large - fewer than 5 available for next day dispatch.